– Receive announcements from SPLC during the event. Visit the Whova website to view the short tutorial video or read step by step instructions on how to optimize your app experience. The tutorial covers downloading the app and logging in to your profile, networking features, agenda organization, and much much more! 1. Visit the App store of your choice and download the Whova- Networking at Events app. 2. 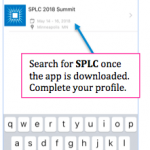 Click “Find your event” and search for SPLC. 3. 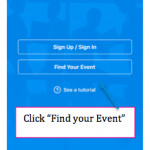 Select the event and on the following screen, click the “Join” link in the bottom blue bar. 4. Login using your social media account or the email address you used to register for the conference. Speakers: Please use your conference email address to access your presenter profile which is pre-populated with the speaker information provided. 6. 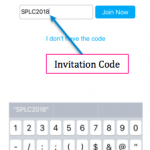 Enter the invitation code: SPLC2018 when prompted.